Once your Barracks have been built, each successful sword production will allow you to add a soldier to defend your village. 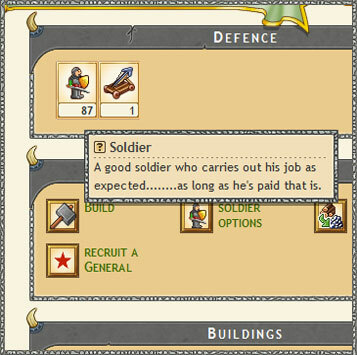 Each time you upgrade your Barracks you will be able to recruit soldiers without pay. Each extra soldier will cost you 1 at the end of each turn. This cost is called Maintenance and is displayed in your Profile. It's also possible to make weapons in the Workshop. Weapons count as units and also count towards your maintenance costs and affect your trade level. Warning : If you don't have enough gold to pay your soldiers, they will desert you. In this case, you must quickly find some gold using your traders.